. "....He took from the men the liberty of marrying when each of them pleased, and appointed that they should contract marriages only when they were in full bodily vigor, deeming this injunction also conducive to producing excellent offspring..."
"An old man should introduce to his wife whatever man in the prime of life he admired for his bodily and mental qualities, so that she might have children by him... "
"He also assigned some of the grown-up boys as ‘whip-bearers’ so that they might inflict whatever punishment was necessary (on younger boys), so that the great dread of DISGRACE, and great willingness to obey, prevailed among them. Lycurgus, though he did not give the boys permisson to take what they wanted without trouble, DID GIVE them the liberty to steal certain things to relieve the cravings of nature; and he made it honorable to steal as many cheeses as possible... "
"He taught the children from a desire to render them more dexterous in securing provisions, and better qualified for warfare." "...I must also say something of the boys as objects of affection, for this likewise has some reference to education.... Lycurgus thought proper, if any man (being himself such as he ought to be) admired the disposition of a youth, and made it his purpose to render him a faultless friend, and to enjoy his company, to bestow praise on the boy; and he regarded this as the most excellent kind of education..."
"Lycurgus prohibited free citizens from having anything to do with business.... they should not desire wealth with a view to sensual gratification. At Sparta the citizens pay strictest obedience to the magistrates and the laws. Lycurgus did not attempt to establish such an ‘Excellent Order of Things’ (EUNOMIA) until he had brought the most powerful men in the state to be of the same opinion as he was with regard to the constitution... OBEDIENCE is of the greatest benefit, as well in a State as in an army anda family..."
"An honorable death is preferable to a dishonorable life.... At Lacedaemon everyone would be ashamed to allow a coward into the same tent as himself,or allow him to be his opponent in a match at wrestling...."
"Lycurgus also imposed on his countrymen an obligation, from which there is no exception, of practising every kind of political virtue; for he made the privileges of citizenship EQUALLY available to all those who observed what was commanded by the Laws, without taking any account either of bodily weakness or limited financial means; but if anyone was too lazy to do what the Laws demanded, Lycurgus commanded that he should no longer be counted among the number of ‘equally privileged citizens’ (the HOMOIOI)." 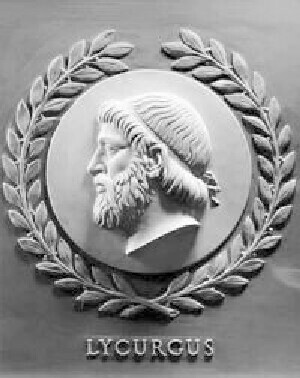 The ‘portrait’ of Lycurgus is part of the decoration of the Chamber of the House of Representatives in the United States Capitol building, Washington, D.C.